Universal mounting in all three commercially available rails. Enclosures inside: 70 x 35 x 60 mm. 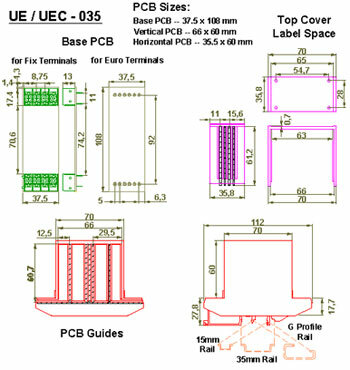 UEC-035-00 Enclosure with Euro Term. Covers (Last two digits indicate number of terminal required 00 - No Term to 12 Max Term. UE-035 Enclosure with Fixed 8 Term.